GB: Approximately how many followers are available to the player throughout the game? What sort of roles or personalities did you seek to fulfill with the followers in Jade Empire? Ray: In Jade Empire you can gain up to a dozen followers over the course of the game. You will adventure and fight with a single follower at a time, so you need to be strategic in choosing which follower is by your side in each situation. In addition to fighting along with the player, most followers can be set to support mode, causing them to avoid combat and either replenish the player's stats or enhance the player's attacks. This gives the player greater tactical options during combat. The followers run the gamut of personalities, much as the party members did in Star Wars: Knights of the Old Republic. Immersive character interaction is a staple of a BioWare RPG, and Jade Empire will be no exception. Many of the followers also have sub-quests that the player will have the option of pursuing with the intent of learning more about the followers and their past. GB: Can you explain a little how the followers work when compared with party members in KotOR? For example, once joined, will the player have the option of retaining them until completion, or will they have their own agenda and leave the party at key points? Greg: The followers in Jade Empire all act independently and pursue their own strategies on the battlefield. Each of the followers you recruit to your cause has very different tactical abilities, strengths, and weaknesses, and the player defines their AI behavior to meet each new threat. Some followers are best in direct combat, while others are better tasked with support functions to help the character out with additional healing, Chi refresh, defense, or various special support abilities. You have the ability to set either an active combat role or a support role for most of the characters (a handful can do only support or combat based on their special abilities). Many followers have their own back story and personal agenda, and the way you interact with them (along with your actions in their presence) will determine your relationship with them. Like most of BioWare's games there is even an option for romances with some of your followers. GB: If followers remain with the PC, do followers gain experience along with the protagonist, even while being out of the party? Ray: The followers gain power and experience along with the player regardless of whether they are currently selected or not. We really wanted the tactical freedom for players to choose any follower for any situation and not feel like they are taking a penalty for using a follower they don't typically use. Switching followers to address different combat challenges is a smart way to play and we want to support this play-style. GB: Do followers have inventory and can they be leveled up, and does the player have full control over their stats, inventory and leveling up, if applicable? 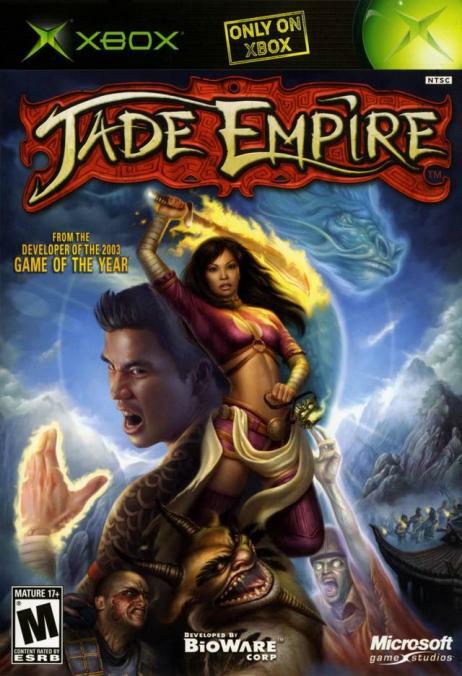 Greg: Jade Empire is, at its root, a single character game; the player plays his or her own character. The rich story and tactical elements that followers add to BioWare games encouraged us to include a dozen followers that player can collect in Jade Empire. The player can change the follower tactics during battle, and they can also change followers between combats to suit their needs (sometimes you'll find a specific follower will be very effective against certain opponents and thus will make the difference in the battle). The followers are fully realized, fully independent, characters who think, act, level up, and play as befits their character and place in the game. Their AI during combat is excellent and they are very useful in both a support and an attack role. The followers can find their own magic weapons during the game and upgrade their attacks. GB: Will followers have their own back story and perhaps personal missions/quests? Ray: As mentioned earlier, followers in Jade Empire will all have their own personal back stories, and each one will also open up unique quests you can embark on to advance their story or to learn more about their past. Certain quests will only be available to you with a specific follower, and your alignment and relationship with the follower can also determine quest availability. The followers also add a lot of interesting color commentary to the quests the player undertakes each follower has a different perspective on the player's actions and isn't shy about sharing it! GB: Compared with KotOR, how much more or less voice acting is in Jade Empire? Have we heard any of the voice actors in past BioWare games? Greg: Every line of dialogue in Jade Empire has been recorded and is used as a voice-over within the game. We had over 90 voice actors involved, including some prominent names like John Cleese (he did a spectacular job in the game) as well as some other well-known actors. Recording the more than 320,000 words in Jade Empire has been a massive undertaking, but the fully voice-acted script adds tremendous atmosphere to the world we've created. To further add to the immersive nature of the game, we hired a linguist to develop a unique language for Jade Empire, known as Tho Fan (or Old Tongue), and even lines spoken in that language have been recorded for use as voice-over. Overall the world, story and characters of Jade Empire are exceptionally rich and detailed.